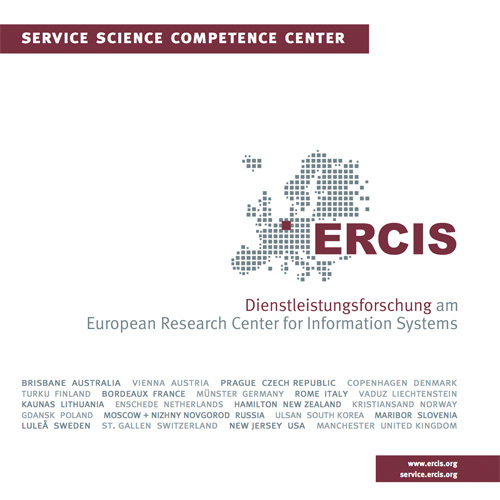 FlexNet | ERCIS Competence Center "Service Science"
Service networks made up of manufacturers and service firms to satisfy complex customer needs are proliferating. By exploiting their complementary competencies, such service networks enable their members to provide innovative and integrated solutions that could not be offered by any of the firms alone. A specific challenge is to enable networks of companies to quickly adapt their business models to dynamic changes in their environment. In the research project FlexNet we have designed methods, electronic documents, software tools, and other solutions that enable companies to network their business processes and information systems with other companies in order to design, offer, and deliver complex value propositions to their clients collaboratively. Drawing on existing works on boundary objects and service blueprinting, we have developed a new method for diagnosing boundary spanning processes and identifying candidates for IT-based boundary objects that integrate the sub-processes of manufacturing companies and service companies. As boundary objects we have designed and standardized a set of electronic documents and interaction routines that companies can re-use and adapt in order to integrate with the partners. All methods and tools are provided in the integrated software tool FlexNet Architect. The FlexNet Architect is a planning and modeling tool for integrating business processes and information systems in service networks, based on planning workshops conducted with the involved stakeholders. In addition to these core results of the research project we have designed and implemented a research map that depicts and categorizes contributions of the international service research discipline and that is made available through a web portal. The FlexNet project was kindly supported by the German Ministry of Education and Research (promotion sign: 01FD0629). More information is available at: https://www.uni-muenster.de/forschungaz/project/261. The research map of the service science discipline is accessible at: http://www.forschungslandkarte-hybridewertschoepfung.de/.